With summer closing and my second year of college approaching, I picked up another job. This job is on a farm. The description says I must weed and harvest. So I’ll do the same with the Mets, as I take a look “on the farm” at some of the Mets prospects (or weeds — it depends on your perception). So, who is this Zach Wheeler and why should we be happy he is a New York Met? Well, for openers, Wheeler is the textbook example of “live arm,” having a 10.7 K/9 ratio in low-A in 2010. Zach is a groundball machine and has the stuff to become the front end starter the Mets need if they are ever to return to contention. 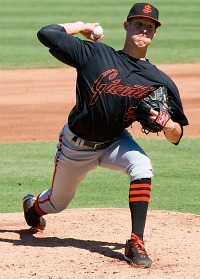 This year, pitching for San Jose in the California (high-A) league, he has gone 7-5 with 98 Ks in 88 IPs. Walks continue to be an issue, as he has also issued 47 of them this year, a slight improvement to his 5.89 BB/9 ratio last year. So he’s got some work to do, but at 21 and in his second pro season, he certainly has the time he needs to work things out. Kudos to Sandy Alderson on a getting a player with the potential to become the Mets next great ace. For what it’s worth, he immediately becomes the Mets best prospect. Not a bad haul for an aging outfielder with a stupid clause in his contract. My guess is that Wheeler will finish the year in the Florida State League and maybe get an invite to Spring Training next year. One thing for sure, with Wheeler, Harvey, Familia and Mejia, plenty of trips to Eastern League Reading and International League Lehigh Valley will be in my travel itinerary next summer when the Mets farm teams come to town. 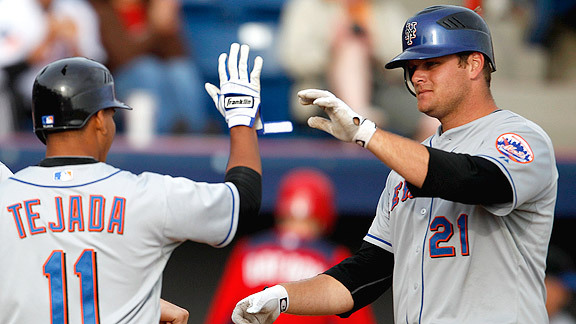 Lucas Duda isn’t your typical baseball player. At times, he resembles a lumberjack. Other times, he resembles one of those big teddy bears you win at a carnival. But does he look like the starting first basemen for the Mets? Instead of talking about every draft pick, lets focus on some of the more interesting ones.